The Betta genus is a part of the Gourami family (Osphronemidae). Earlier, the Betta genus was considered a part of the Anabantidae family. The reason behind this is the fact that all Betta species have labyrinth organs, just like the Anabantidae species. The labyrinth organs make it possible for Betta and Anabantidae species to absorb oxygen directly from the air. It is an adaptation to a life in low oxygen waters. Some irresponsible fish stores sell Betta fish in vases and tiny bawls without any form of aeration, and claim that the Betta will do well in such a tiny space since the fish can breathe oxygen from the air. It is true that many Betta fishes will survive in such conditions, but there is a huge difference between merely surviving and really doing well. One of the most commonly kept Betta species, the Betta splendens, can grow larger than 7 cm (3 inches) and will require at least 3 gallons of water to do well. Other Betta species will have other requirements, depending on size and temperament. The Spotted betta, Betta picta, is the type species for the genus Betta, but as mentioned above the most commonly kept and well known Betta is another species – the Betta splendens. When the term Betta is used in everyday language it often refers not to the genus but to this particular species. Betta splendens is also called Siamese fighting fish and the males are highly territorial and will fight each other viciously if placed in the same aquarium. 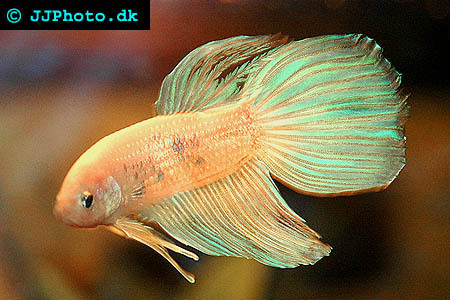 Betta splendens have been extensively bred and can today be obtained in numerous variations. There exist at least 13 different colourations and an abundance of tail configurations. A male Betta splendens can be easily recognised by his long and flowing fins. The females are without such extravagances, and they are also considerably smaller than the males – 1.5 inches compared to the 3-4 inches of the male. When you buy a Betta you should choose an individual that is energetic and have an open finnage. A male Betta with clamped fins is weak, ill or suffering from stress. Since a Betta seldom becomes older than 2 years it is unadvisable to buy a large Betta. A large Betta is usually an old Betta, and will not live for very long in your aquarium. Also take a closer look at the skin and fins of all the fishes in the Betta aquarium. Bettas are sensitive to external parasite infestations, and many Bettas suffer from ichthyophthiriaisis (ich) and oodiniumiasis (velvet). Do not buy Betta from an aquarium where one or more fishes show signs of illness, since the Betta might be infested but still not showing any signs. You can find Betta splendens in most ordinary fish stores. Those interested in breeding Betta should however consider buying their Betta directly from a recognized breeder. It will be more expensive, but you can get Betta with a much higher quality and the fish will more suitable for breeding. Since the Betta is a tropical fish it requires warm waters to do well. Bettas are sometimes sold in unheated vases and tiny bawls, and can freeze to death if the temperature in the room where they are kept is to low. The water temperature should always be in the 80-85 F range. Many Bettas also die from jumping out of their aquarium, so a good cover in recommended. Decorate the aquarium with live plants and avoid any unnecessary surface movements. Bettas prefer a pH of 7 or slightly below, and moderate water hardiness. Since the male Betta is extremely territorial several males should not be kept together in the same aquarium. It is better to keep just one male Betta with several female Bettas; as long as you make sure that the female Bettas have a lot of good hiding spaces in the aquarium. The male Betta is not only aggressive towards other males; he will chase the female Bettas around as well and without suitable hiding places the female Bettas will become much stressed. You can of course keep only female Bettas to avoid this problem, or keep a male Betta with nothing but other species that won’t be harassed by him. Betta is often kept with Swordfish, Platy, Angelfish and small Gourami species. You can feed your Betta meaty foods (fresh or frozen) or special Betta pellets. Your Betta might need a little help to understand that pellets are actually food. If your Betta refuses to eat pellets for a long time you should offer it other types of food, since Betta fish sometimes starve to death when they fail to understand that they are supposed to eat pellets. Your Betta will more readily accept meaty foods, including brine shrimp, tubificids, daphnia, blood worms and grindal worms. Feed your Betta twice a day or more. If you have other species in the aquarium you might need to lure them away to make sure that your Betta gets any food at all.